What follows is my report to National Grange made last month in NH. I wanted to share it with everyone here. Please read the following with the intention in which it is written, to have a stronger, more visible, united Grange throughout Connecticut and the United States. On behalf of all the members of the Connecticut State Grange, Jodi Ann and I welcome all of you to Manchester NH for the 147th Annual National Grange Convention and hope you all enjoy your stay in the Northeast Region. The Connecticut State Grange held its 129th Annual Session in Norwich, CT October 17-19, 2013. We were honored to have National Pomona Chris Hamp and Brother Duane as our National Reps. They both added to our session and I know our membership reaped a great deal from their being with us. When I was elected Master in 2010 I set a goal for the Connecticut State Grange to double our membership in 4 years. We have not made great strides toward this goal; as a matter of fact we have posted a net loss for the year ending 6/30/13 of 141 members. Our total membership is 2,634. We have seen continual losses for over 20 years. We can no longer tolerate losses of this magnitude. We can no longer tolerate our Granges not bringing in new members. We can no longer tolerate our Granges, at all levels, not developing new leaders to ensure a clear succession plan for our Grange. Even though I have stated the above, all hope is NOT lost. With 2,634 members, 8 Pomona Granges, 54 Community Granges and 2 Junior Granges we have the time, the talent and the ability to turn things around. There is a bright tomorrow, there is an incredible opportunity for us to grow our existing membership and grow our number of Granges. All we have to do is want to do it. On May 20, 2013 something that hasn’t happened in nearly 60 years took place. The Charter application was signed for Groton Community Grange # 213. I want to congratulate Jeff Barnes, Organizing Deputy and Sisters Knockenhauer and Matthewson on their tireless effort to seeing this new Grange to fruition. This is a great beginning to what we see as continual and sustainable growth in Granges. This year we also witnessed the closing of three Granges in Connecticut, Tunxis, Cherry Brook and Watertown. When I meet with these Granges every member is concerned with how they will be remembered. Attending these last meeting is very much like attending the calling hours for a loved one. Our members put their blood, sweat and tears into building their Grange. We are working with one other Grange that is in the process of selling their Grange hall and surrendering their Charter. Many Granges have expressed their concerns regarding maintaining their halls, and in some cases their halls have fallen into disrepair. Your Grange hall is your home. It is the first impression the community has of you as an organization. If you don’t take the time to have the pride in your own home who will? I realize the age of many of our members inhibits your ability to do what you once did for your Grange, but the answer isn’t to sell the Grange hall; selling your hall is the easy way out. Every Grange must be continually seeking new members. Our message has not and will not changed; one new member per Grange per month. You are not doing this for the State Grange; you are doing this for your own Grange. I urge ever member to pledge to their Grange to bring in one new member this year. Without you, there is no Grange. Clifford and Trevor Gervais represented the Connecticut State Grange and the Northeast Region as a Marching Candidate and Gatekeeper respectively, in the First Degree in the original Degrees written in 1873 at the Kelley Farm in Minnesota in July. All reports I have heard state they did a great job and had fun. Clifford has also been named to the Executive Committee of the National Grange Youth Officer Corp which will open the National Grange Friday morning. Jaimie Cameron has been selected as a Marching Candidate in the Seventh Degree. Congratulations to you each of you, I know you will do an excellent job. 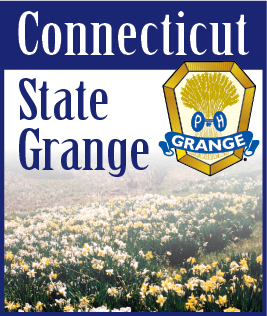 Connecticut has two Junior Granges, Hillstown Junior Grange # 87 and Ekonk Community Junior Grange #101. Both of these Junior Granges are extremely active and making an impact in their communities. I urge and encourage all members to support the Junior Grange program; after all they are our leaders of tomorrow. We are extremely excited to be working with Winchester, Wolcott and Simsbury Granges on organizing new Junior Granges. I urge and encourage every member at every level in every Community Grange to take a hard look at who they are as a member and ascertain as to if you are truly acting in the best interest of the Grange and abiding by our various obligations. One is “I will support the Constitution of the National Grange, the By-Laws of this Grange, and I will inculcate a strict obedience to all laws and edicts emanating from the proper authority. I will not take advantage of the position to bias in any way, either directly or indirectly, the political or religious opinion of any member of the Order.” Even though this is part of the Installation Obligation I feel it is one of the most powerful Obligations we have in the Grange and applies to all members regardless of stature or rank. It says a lot, I will support, by virtue of my position, the LAWS and RULES of the Grange, and will not allow our differences of opinion or beliefs to prevent us from reaching a civil and amicable resolution that is in the BEST interest of the Grange and all of its members.